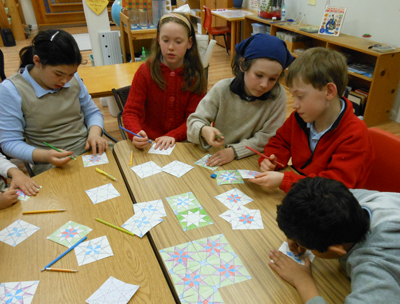 Students learn how to make geometric tiles with compass and straight edge. Over the last 35 years, children and youth with a wide range of learning modalities from the the highly gifted to those with learning disabilities (and many with both!) have thrived at the World Community Education Center. Admission to the WCEC is a simple but careful process. An important element of our students’ success has come from making sure our methodologies are compatible with the parents’ vision for their children’s education. The first step in applying to the World Community Education Center is a visit by you and your child to the school. Please click on the link below to contact us and arrange for a school tour and an interview. New Enrollment for Elementary thru High School Academic Year closes July 1st. Primary School has rolling enrollment, at the discretion of the Primary teacher. Once you have met with us and we agree that WCEC is the school for your child, please download the forms below, fill them out, and send them to us.